It's always wise to have some substance in your stomach before venturing up and down Dirty Sixth. The Old School Bar & Grill is smack in the middle of the action, and its chicken-fried steak (a battered New York strip, see!) is a fine way to start the night. It's cooked up on the flat top, served up with garlic mash and Texas toast, and it'll keep you going longer than you ever thought possible. This place not only has one of the best brunches in town, it also has a chicken-fried steak that is hard to compete with. Try to go easy on the free popcorn, because the steak is big. This steak is smothered in a thick chipotle cream gravy that adds a nice bit of heat to the dish. If you go with the mashed potatoes (or as they call them, Garlic Yukon Mashers), be sure to ask for a little extra gravy on the side. Gourdough’s has long been known in Austin for its off-the-wall and artery-clogging donuts that it sells from its trailer, but it also has a full restaurant that whips up some pretty fine eats, including chicken-fried steak. Gourdough’s piles up a hand-battered steak with a potato pancake and thick white gravy, and tops it off with some house-made cranberry-habanero jam that takes things in an unfamiliar-yet-welcome direction. Oh, and sorry about burying the lead, this is all laying on top of a piping hot donut! 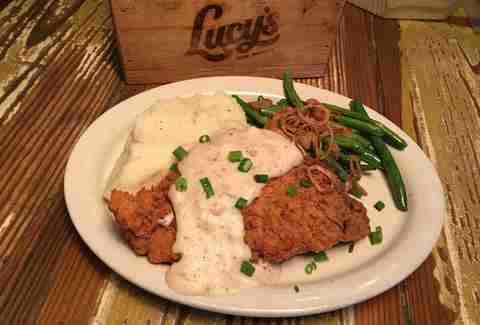 People rightfully flock to Lucy’s for the fried chicken, but when they're applying that frying ability to beef, things get even more interesting. 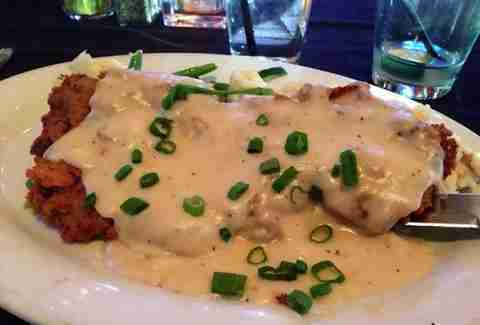 The chicken-fried steak is a fairly regular special, and you'll find different styles depending on which location you hit, but you know the batter will be golden and the cream gravy will be plentiful. Everyone else can keep their poultry. 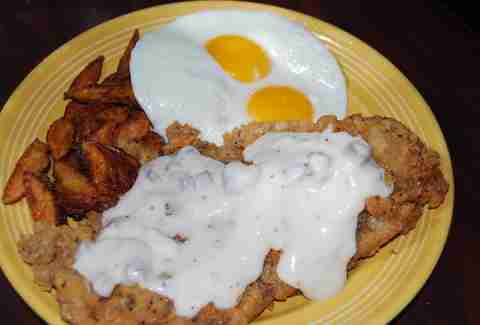 It is hard to say what makes the chicken-fried steak at Hyde Park so great. It follows the traditional style of stake cutlet dipped in buttermilk and batter, but once you take that first bite, it's so flavorful that it seems like there must be other magical elements at play. The cream gravy is spiced perfectly with fresh cracked pepper that blends perfectly with the seasoning of the batter. Simple on the surface, but not easy to replicate. Fair warning, this is going to set you back a bit, but the $19 price tag is quite worth it. The chicken-fried steak at Olivia is only sold during brunch, so you’re gonna have to get up early to taste this work of art. 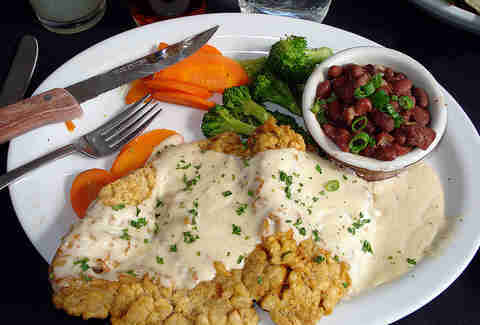 Olivia named its chicken-fried steak after Texas music/420-friendly legend Willie Nelson. The 6oz steak is fried to perfection, then topped off with red-eye brown gravy, herb smashed potatoes (red-eyed and herbed? We see what you did there), and served with a green salad with buttermilk dressing. For health. If you want a great taste of the hill country, Jack Allen’s is the place to be. It takes a New York strip and batters it up to golden perfection, and the green chile gravy brings a much welcome kick. Wash it down with a Z Tequila cocktail to really bring it all together. Opal Divines is a damn fine patio bar where you can just spend the whole day. 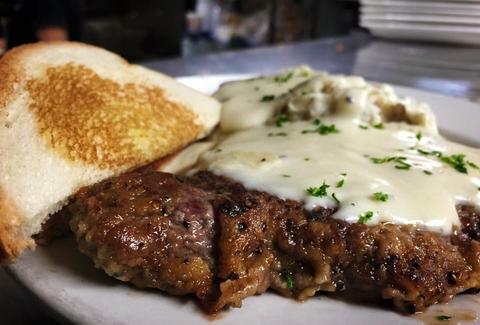 On the weekends, it features its Creekstone ribeye chicken-fried steak smothered in creamy gravy with two eggs, home fries, and toast. It's enough to power the most ambitious of day-drinking plans. 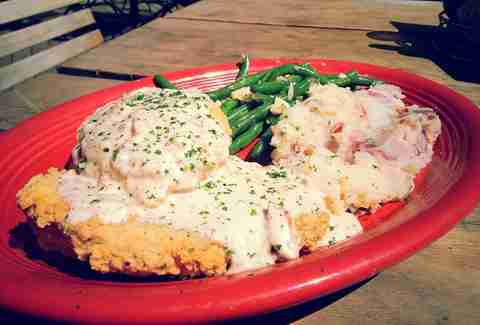 If you want a taste of true Southern cooking in Austin, look no further than Hoover’s Cooking. Chef Hoover Alexander makes some of the best fried chicken in town, so it's no surprise his steak fame is equally on point. If you really have an appetite, you can go for a two-cutlet plate with two sides -- just make sure you don't have any pressing plans for the rest of the day. Red’s Porch is yet another place you want to be when the weather is right. 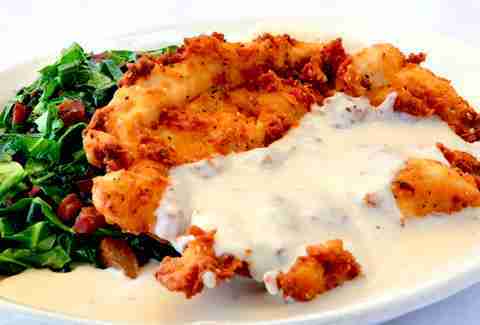 Hit the patio, order some drinks, and prepare for the chicken-fried steak, which is both massive and coated in incredible bacon gravy. You get bacon & horseradish mashed potatoes and one side, which, for a modest dollar up-charge, could be the green chile mac & cheese. So make that move. Then prepare to not move.